TAVR is a new, innovative, and minimally invasive approach to replace narrowed aortic valve (aortic stenosis) using a catheter through a small incision in the groin or chest. Compared to traditional aortic valve replacement, TAVR does not require opening the chest or stopping the heart and therefore offers lower complications and faster recovery time. TAVR may be appropriate for certain patients with symptomatic, severe aortic stenosis. It is ideal for those who are not candidates for open heart surgery to to increased surgical risk or significant health problems. The MitraClip procedure represents a less invasive option for eliminating leakage and regurgitation through the mitral valve in patients with high surgical risk. Since it does not require open heart surgery, the perioperative and postoperative risks of the procedure are significantly reduced. A coronary artery bypass graft, often called CABG and pronounced “cabbage,” is commonly known as bypass surgery. The primary goal of the procedure is to improve blood flow to the heart muscle by creating a new pathway for oxygen-rich blood to reach the heart, bypassing a diseased artery. This is typically performed when arterial plaque has created enough of a blockage that the patient’s cardiologist believes that there is a high risk of a heart attack. A minimally invasive procedure performed on arteries where the blockages are pulverized and partially removed (the “roto-rooter” procedure). unlike angioplasties and stents below, an atherectomy removes plaque from the blog vessel wall. You ard your physician will decide whether a directional or rotational atherectomy is right for your particular circumstance. The most common treatment for blocked arteries, where a blockage is partially opened with a balloon and then a metal or absorbable stent is placed to act as a scaffolding and hold the artery open. The procedure essentially pushes the arterial plaque aside, thus opening the blood vessel. The stent keeps the blood vessel open, improving blood flow to the heart and can, in many cases, improve or eliminate chest pain associated with angina. Stents can also be used in other parts of the body where blood flow is reduced as a result of a build-up of plaque. Drug-eluting stents, or those that release small doses of medication into the blood stream over time may be used for certain cases and can help prevent re-blockage of the artery and blood clots. A diagnostic procedure where hollow catheters the size of a spaghetti noodle are threaded from an artery in the wrist or groin to the heart to measure pressures and look for blockages. 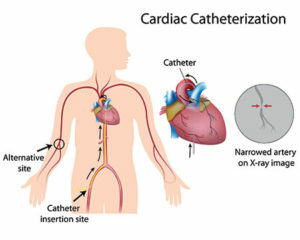 Cardiac catheterization is used for many procedures including the treatment of common heart rhythm disorders (arrhythmias), angioplasties and more. The precise and minimally invasive nature of the cardiac catheter allows for improved outcomes and faster recovery. Cardiac catheters can be used for exploratory and treatment purposes making them a very versatile tool. The same procedure as balloon angioplasty above but specifically referring to arteries in the heart rather than elsewhere (legs, kidneys, neck, etc). Neuro intervention and Carotid Stenting-Taking pictures of the arteries supplying blood to the brain and treating blockages in the neck (carotid artery) with a balloon, stent, and a filter to capture debris and cholesterol released when the balloon is inflated. Peripheral Arterial Intervention and treatment-Treatment of blockages outside of the heart including the neck, abdomen, arms and legs where a blockage is partially opened with a balloon and then a metal or absorbable stent is often placed to act as a scaffolding and hold the artery open. Peripheral Renovascular Angiography- A diagnostic procedure where hollow catheters the size of a spaghetti noodle are threaded from an artery in the wrist or groin to the kidneys to measure pressures and look for blockages.